This entry was posted on July 19, 2012 by elliecm. It was filed under Communication Breakdowns and was tagged with Arctic Apples, Farmer, Favr Savr Tomato, Genetically modified organism, GMO, Monsanto, Mother Nature, Ray Prock, rBGH, Round-Up, tail docking. I view the non-browning apples as a new generation of GMOs. Almost every other GMO crop available provides some advantage while the crop is growing, disease or pest resistance, herbicide tolerance, etc. These apples provide something tangibly different from non-GMO apples to the consumer, namely they don’t brown. Apparently the developers and growers of these apples believe that some consumers will be willing to pay a little extra for this trait. They are providing something that the consumer wants. I don’t see that as any more “greedy” than marketing certified organic, free range, etc. If the consumer in the store believes that an apple that doesn’t brown is worth the extra cost, they’ll pay extra. This is the same reason why organic foods cost more, because they provide something extra to the consumer. I do agree that if given a chance there is a tendency for both sides to take a mile if given an inch. As far as the brown apple goes I am fine with apples that brown but what about a consumer who wants an apple that does not brown? Who are we to say they cannot develop it, grow it or even eat it if it is done safely and responsibly? You and I do not have to buy it but maybe someone out there does. I support your right as a consumer to buy what you wish. Should we not support those who have other trains of thought? You stopped worrying about your garden a few months back. Farmers do not have that option. If they did it would be a huge economic and social disaster. This is why we need continued research and development to help us farm the soils and weather conditions that are at hand. Without the tools and science we have developed for our farming toolbox it would be very “scarypants”! Ellen, I am ever more sruprised by how many things I think alike with you. I agree that a step back from science agriculture and a step forward from…help me with the right word?…non-science agriculture is needed now, not later. We plant GMO cotton because it keeps us out of the field and away from pesticides. We have significant insect pressure here because we are at the point on the map where the lush Rio Grande Valley meets the sand of the plains, i.e. end of the road as far as much for bugs to eat. It also keeps the tractor out of the field and allows us to use the smaller, lower fuel consuming spray rig to apply herbiside to kill weeds two or three times a year. We like that better than putting pre-emergent herbisides down in the soil, which can have longer term effects. The drought and heat resistant portion of our cotton comes from old fashion hybridization. We could plant non-GMO cotton, like my brother-in-law does north of here. Most of the dryland farmers up on the high plains of Texas don’t use GMO seed, but they do use the hybrid seed. They don’t have much insect pressure and way fewer weeds to contend with in the sandy soil, so they still put tractors in the field a few times a year to plow them. I think these uses of GMO technology are a very good thing. I had shared an article with you about GMO technology which was used to save the papaya (or mango can’t remember which!) I think that was a very good thing. An apple that won’t turn brown, maybe not so much, I’ll have to look at that one a bit more with some apple growers I know. Maybe neither side are “Crazypants,” but instead just a little too excited! A step back and a step forward. You “wanna know what you are now going to do about it.” We’re doing right here Ellen. We’re being noisy and loud and getting both sides to listen! I think that’s amazing. I’m very glad I met you and Grant, very, very glad. Its interesting to see that they have developed an apple that does not brown… Somehow I feel there will always be a bad apple in the bunch, mother nature will always find a way to outsmart us. I have always said we need to find a way to work with her on our farms instead of finding ways to outsmart her. For me on our farm it means a mix of science to better understand the environment I am working with along with the art of farming that has been handed down to me through several generations on this farm. Good point with the tail docking example, science does not support it, unfortunately there are several that dont know what the science says or quite frankly dont care. This is where I think the California Farm Bureau did a great job when they teamed up with the Humane Society of The US to get a bill passed that banned tail docking of dairy cattle in the state. If I am not mistaken some other states have made similar standards in regard to tail docking. I do want to clarify that the science on tail docking we are talking about is for dairy, as with other species like pork and sheep there are advantages to this practice. I understand what you are saying. Science is one part of the equation and at times other things are done cause they have been. I think its fine to question things and keep pushing to understand. And those of us in agriculture should be doing some introspection. You may understand rarely do scientific possibilities get developed just because they can be done. There has to be a value to it in order to sustain investments. I haven’t looked at any of the science on the no browning apple but simply on the surface, I have to think that is a characteristic that some moms and kids would like. I am thinking about how often fruit gets packed in school lunches & snacks. If you can cut it up in the morning and the kids still will eat it at school, that may help us get more kids to eat their daily recommended number of fruits & veggies. And I could see more restaurants considering apples for salads if they could cut them up a few times a day. Whether that benefit is enough to balance the GMO trait will be different for some people, with both yeas and nays I bet. I’ve been enjoying you blog for a while now, but I thought this was a good time to comment. I just got to tour one of Monsanto’s breeding facilities. What I learned there was really mind blowing. One of the big things I took away from my visit was in the past companies like Monsanto were trying to focus on helping out the farmer. But now they want to help out the consumer, for example non browning apples and beneforte broccoli. I think it is fairly understandable why people would like foods that contain more nutrients or are more convenient. I think when consumers see the benefits of some GMO traits they will be more receptive to them. You seem to have a very open mind and genuinely want to learn more about this topic, a lot like myself. Have you considered touring a Monsanto facility? It was one of the most eye opening experiences I’ve had in a very long time. And it was nothing like I expected it to be, they were so very open. I’ll be writing more about on my blog, but I did manage to get one post up so far http://thebeefjar.com/2012/07/12/field-trip-welcome-to-monsanto/. I love that you used Dr. Bodnar as a talking point here. I’ve been following her on twitter since before she earned her Ph.D. She is a wonderful person to learn from too – she really takes a science based approach and tries to make it less scary for people like me. As a rancher I feel like I owe it myself and my consumers to learn as much about my industry as I can, that is why I have been trying to keep an open mind and learn as much as I can about all sectors of agriculture. It’s been a wonderful experience and has both diminished my fear of the food I eat, but is also making my Ranch a better place. Good luck on your journey. 1) how do y’all feel about cloning? is that too far? if so, what makes it too far? 2) how do you guys feel about pot being legalized? If I want to buy and smoke pot, by your reckoning, I should be allowed. Someone should be able to grow it and I should be able to smoke it, right? After all, it is rather randomly illegal, in a way that alcohol was illegal back in the day and of point in fact is not a menace to society the way, say, bath salts could be argued to be a menace. 3) should kids younger than 18 (is that the age?) be able to smoke? They can drive, why can’t they smoke? It’s their parents’ problem if they smoke too young, right, just like it is their parents’ problem if they drink too much soda and get diabietes. How do *you* decide what is too much? 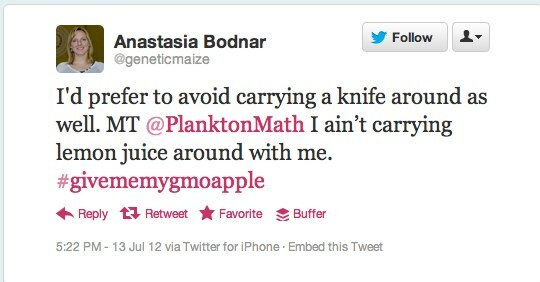 But a non-browning apple? Is this really where we want to blow the wad of gambling in areas of science that we absolutely do not have the full story? Yes, it would be super convenient for all the moms out there whose lives I can’t comprehend because I don’t have kids. But do the moms know that the science on those non-browning apples is maybe current but is certainly not conclusive. Do they know that we don’t know and that maybe little Jimmy is gonna develop an allergy or ADHD or who knows what? He might not, to be sure. But he might. Is there gonna be a warning label on it, like their is on cigarettes and alcohol for pregnant ladies? I’d venture not. I’d venture there are moms out there that don’t know the impact that food dyes have on their little kids’ brains. Food dyes they get from convenience foods. There’s no warning label. There’s no information. Convenience is a very alluring idea in this world we live in. People certainly buy it in quantity every day. But when is it a responsibility of society to say — hold on there, maybe this isn’t a good thing? Personally, I think moderation is the middle way. GMOs that solve a real problem for farmers, like growing in drought or resistance to disease may in fact be worth the risk of superbugs and all that. You could argue that point convincingly. But if we’re gonna go with the “sell the customer what she wants because it is her right,” then you all better be in support of every other damn thing that customer wants that falls under the auspicious of “what I do in my private life is my business.” Things like assisted suicide, abortion, the right to text while driving with penalties coming only if there is an accident, the right to marry whomever someone wants to marry. Maybe it sounds ridiculous and maybe it offends your sensibilities. Can’t have one theory for one topic and then another theory for another. So, are you ready to step up and proclaim stand behind your “let the buyer have what she wants” across the board? Suzie, blog post on Monsanto coming soon. Cloning will be commonplace in the 24th century, just watch Star Trek. Seriously, I don’t know on that one. If we can clone new organs for someone needing a kidney or a heart or a liver, wow. Pot? Take a trip to Jamica, see what a culture revolving around pot is, then come back and ask. I don’t want to become another Jamica. Can we grow/use/distribute pot without becoming Jamica? My husband had been in favor of legalizing pot for years (for a conservative country farmer, sorta surprised me,) because he thought it could stop a lot of crime and raise some good tax money. Then we went to Jamica. Now we thought the island was beautiful, the scuba diving was world class but when your tour guide on your bus does a pot deal out the door of the bus, and you are approached a hundred times a day to buy the dumb stuff yourself often by kids no older than our grandkids, he came home with a different opinion. Smoking: No one on the planet should smoke. It’s stupid. You should wait till your 18 to drive. Having raised a son, both of these would have made my life easier and my insurance cheaper. Suzie, you mighta missed the point. The point is, you are either “for” people being able to buy what they want or you are “against” it. If you believe the artic apple should be produced and sold because people want it and that’s enough reason, then it follows that you must be “for” people being able to grow and sell pot or cigarettes — whether you think it is stupid or not. I think Ellen is exactly right on this one – be consistent (consumer demand is king) or admit that it’s really about a strange blind eye we turn to anything labelled progress. The problem for me: this isn’t really about consumer demand. Consumer demand doesn’t exist in a vacuum. Did consumers “demand” for McDonalds to sell larger and larger soft drinks? Not quite – McDs offered them, and they sold well. Then they retroactively insisted that consumers “demanded” all that junk food. Same with any number of new consumer products that turned out to be not so great in the end. We can’t forget that marketing and propaganda is a powerful tool, for good and for bad. But when we’re talking about something that no one cared much about for millions of years (apples browning) and calling a demand to change it “consumer demand” I get confused and concerned. Did hordes of people throw down their apples in disgust simultaneously and demand a technological change? No. A scientist decided it was something that COULD be done, and when people heard about it, their laziness led them to support it. I seem to recall a West Wing comment about nuclear arms control – we shouldn’t care what the public thinks or work based on opinion polls – the issue is too complicated and too serious. Instead, we need a rational cost-benefit analysis, done by a variety of experts with different positions, of each of these changes, compared with the potential that they will cause massive problems to the environment. Didn’t miss the point, just don’t have a simplistic answer at this time. Which, really, was my point. This stuff is not as easy as “hey, mom’s want to send kids to school with apple slices, so let’s let ’em!” Nor is it as easy as “hey, don’t stand in the way of kids eating more fruit!” as if a browning apples is the problem with our children’s deplorable diets and NOT the fact that they are force fed junk like so many foie gras ducks. I think it is completely shortsighted and somewhat ridiculous to argue that because people want it, we should let producers produce it. Because, quite frankly, if you argue that point then you’d have to argue in favor of legalizing things like Bath Salts and Crank. (Did you read Freakonomics? Those poor drug dealers don’t make enough money to move out of mom’s house!) But we don’t, because we are a little more evolved as a society than that. And all I am asking is that we apply that prudence to things we don’t know about if we can. I get the need for the GMO papayas. That was awesome. These apples are hardly the same. They are a marketing tactic. That’s it. And no one has given me one decent reason to think otherwise. Janice, yes, I agree of course that “rarely do scientific possibilities get developed just because they can be done. There has to be a value to it in order to sustain investments.” but actual societal value and monetary/shareholder value are two different things. I am for driving societal value full force. But, really, I think driving monetary/shareholder value is probably one of the most damaging influences on our society. This post is not about apples or tail docking. I agree with Anthony that this apple is clearly marketing pushing ahead of consumer demand, and like Ellen says, we, society, need to have some lines we draw regarding the necessity of GMOs. A non-browning apple seems a stretch to me. And for the moms who want a little bag of sliced, non-browning apples for their kids’ lunches, we already have that. Not sure what they coat them in, but they’re on the market. From article: “Essentially, the egg industry is asking for regulation — the first regulation, in fact, that considers the emotional well-being of America’s farm animals. You don’t have to agree with us and you don’t have to agree with this NPR article, but you do have to agree that the science doesn’t support (dairy) tail docking and you might want to consider whether these egg producers have a right to call for legislation within their own industry in order to meet consumer demand and maybe too it is marketing pushing this apple more than consumer demand. Marketing pushed the big gulp. Don’t we as a society care about that? We’re just trying to point out to you all, those in big ag who are confused at our “side’s” vitriol, how we come to these ideas. They are reasoned conclusions. And they have our society’s health in mind, not profit. PS A terrific Meal Post hits this Sunday that speaks to this topic of listening and understanding each other! I can see where the idea of consumers wanting a non-browning apple comes from, in a way. How many moms talk of kids taking 2-3 bites or eating half an apple then having to throw the rest out because it browns? I’ve seen that pretty commonly. Now I wouldn’t have thought of developing an apple that didn’t brown, but that’s me. As for cloning…not an expert there either but dividing from one cell for identical offspring isn’t, it seems, that much further beyond multiple flushing animals to produce multiple offspring per year. I don’t use it, can’t afford it, but see where in some cases some would want it. The biggest difference I see in apples vs other crops is where corn or soybeans are planted and harvested in one year, apples have a much longer “crop life”. What that means, if anything, I don’t know. I am in favor of food choices. And with food choices, I think people should be able to by from me, or Mike, or anyone else they choose to. As part of choices, I don’t know that eliminating a choice is really allowing choices. If they develop the non-browning apple and people buy it, then it’s their choice. If we stop the development of it, it takes that choice from them. I don’t think that compares to drugs, as I haven’t heard of anyone killing others or attacking others under the influence of tomatoes or blueberries. 🙂 There are no easy answers. I don’t think we need to agree with or endorse everyone’s choice of food, and we may make different food choices for ourselves. If it’s developed and sells that’s an answer. If it doesn’t then like the “flavorsavr” tomato it will fail on it’s own merit also. Just want to throw out there that I don’t dock my cow’s tails. To be honest I don’t because I just never really felt the need. But now when asked about tail docking I tell people I figure it’s a point of compromise. My consumers don’t want me to do it, it doesn’t make a big difference on our farm, so I don’t. Good point on the “give an inch”. Reminds me of this: http://www.bbb.org/us/childrens-food-and-beverage-advertising-initiative/. People in general don’t usually seem to care to be told what to do, which I’d imagine is why most of us resist legislation and thus don’t want to “give an inch”. It’s not necessarily that dairy farmers want to keep tail docking, I think it’s more that they don’t want to be told that they can’t. They want to make their own decisions, and of course worry that if they can no longer make a decision on tail docking that they soon no longer be able to make other decisions about their farm. It’s always been my impression that tail docking not a very common practice, and my family has never done it. Voluntary industry agreements to stop or modify a practice seem like an option that might satisfy farmers. I’m just not certain that it will satisfy everybody else.